Central Alabama CrimeStoppers encourages members of the community to assist local law enforcement agencies in the fight against crime by overcoming the two key elements that inhibit community involvement: fear and apathy. CrimeStoppers provides a telephone number and Web Tips to encourage citizens in the community to volunteer vital information helpful to law enforcement agencies to fight against crime. January 30th was the Central Alabama CrimeStoppers organization’s 22nd annual banquet at the RSA Activity Center in Montgomery, a time to honor individual police officers across our area for heroic, and lifesaving work conducted in the previous year. Each of these officers were also deemed Officers of the Year for their individual departments. Sarah Stephens, co-owner/editor of the River Region's Elmore Autauga News, served as the Mistress of Ceremonies, and is in her third year serving on the Board of Directors for CAC. CAC Board Secretary Vivian Crosby gave powerful statistics to the large crowd, showing how law enforcement and media working with CrimeStoppers can make an enormous impact, and bring criminals to justice. Over the past 22 years, 9,209 tips were received by Central Alabama CrimeStoppers. From those tips, 6,776 charges were filed, there were 2,408 arrests and $153,469.02 was given out in rewards for information that led to an arrest. During the calendar year of 2018, CrimeStoppers turned over 797 Tips to Law Enforcement resulting in the apprehension of 157 criminals and the signing of 659 criminal charges filed by victims of crime. During this same period, CrimeStoppers’ Board of Directors voted to pay out a total of $15,500.00 in reward money to tipsters. 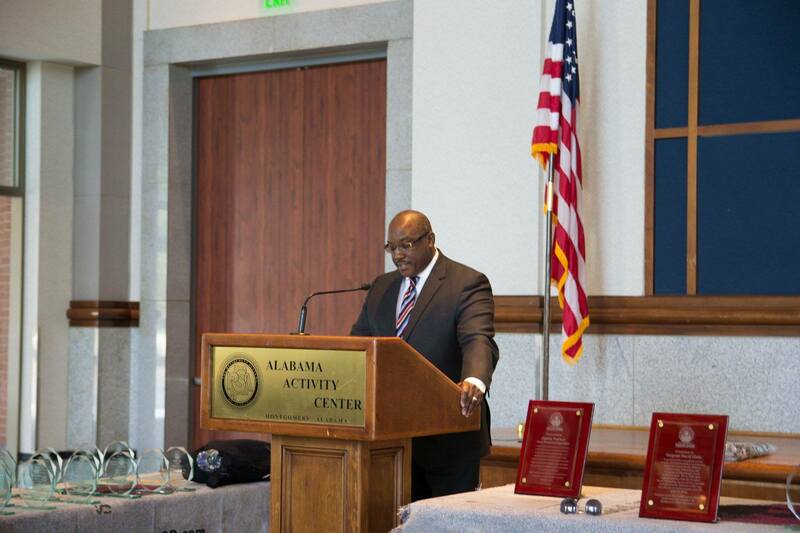 Stephens then introduced the key note speaker for the day, United States Attorney for the Middle District of Alabama Louis V. Franklin, Sr.
Franklin was nominated by President Donald Trump on June 15, 2017 and confirmed by the U.S. Senate on Sept. 14, 2017. He was sworn in by Chief United States District Judge W. Keith Watkins. Franklin is a graduate of Carver High School and a resident of Montgomery. “It is important for you to know I am from here, so you can say I have some skin in the game,” Franklin said. He praised the work of the Central Alabama CrimeStoppers organization, area law enforcement and citizens who come together to fight and prevent crime. “It is not up to the police alone,” Franklin said. He said that a community must also invest in the safety and protection of citizens and report things that are troubling. He mentioned a recent case against former doctor Gilberto Sanchez and many other health care providers back in August of 2017. A tip came in to Central Alabama CrimeStoppers regarding allegations that unnecessary prescriptions were being written to clients. The doctor's office was searched by investigators after obtaining a search warrant, leading to multiple arrests, all because of that first tip to CrimeStoppers. The banquet was sponsored by area organizations including Spectrum, Gulf States, Fraternal Order of Police Lodge 11 and the Prattville Lions Club. During the banquet CAC Chairman Karl Wade, also a retired State Trooper, gave a $1,000 check to Executive Director Tony Garrett to go towards rewards for the CrimeStoppers Tip Line. Officers recognized were given a certificate, an award and a goody bag from Gulf States Distributors. They also received a CrimeStoppers blanket with the name of their department. The special awards recipients received a certificate and award.